Delft Dynamics, Damen Naval Shipyards and the Netherlands Aerospace Center (NLR) have signed a cooperation agreement as part of the ‘NEREUS’ National Technology Project (‘Naval long-Endurance Robot helicopter Equipped for Unmanned Surveillance’). 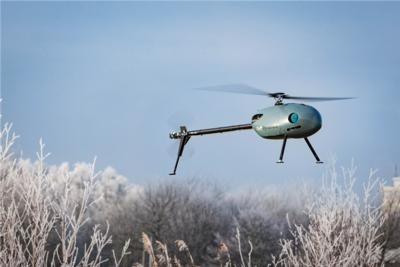 The Dutch Ministry of Defence has commissioned the partners to perform research into innovative technologies for conducting unmanned helicopter operations in a safe and (cost-)efficient way from Navy, Coast Guard and other vessels. The focus is on determining the operational weather limitations and the interactions with ship movements. Delft Dynamics developed the helicopter, Damen Naval Shipyards will supply a suitable test vessel, and NLR will conduct research into the operational limitations. The project will start in early 2018 and will last two years. The deployment of unmanned helicopters in maritime environments offers considerable potential. For instance, such aircraft can perform search and rescue operations at less risk and lower costs than manned helicopters. The Navy can also use them to obtain ‘situational awareness’, i.e. a good overview of the surroundings. Test flights will be performed using the unmanned RH3 Swift helicopter model developed by Delft Dynamics. This compact, scalable aircraft requires a working or helicopter deck with a diameter of 4 to 5 metres for take-off and landing. It can be used for flights of 4 to 6 hours at standard load-bearing capacity, making it suitable for a wide range of maritime missions. NLR is contributing to this project in two ways. Firstly, it will apply its expertise and experience in validating manned helicopter-ship operations and investigating Ship-Helicopter Operational Limitations (SHOLs). In this project, NLR will use the same methodology to determine the Ship-Unmanned System Operational Limitations (SUOLs). In addition, NLR will be involved in the so-called ’marinization’ of the helicopter: how can we make the aircraft suitable for ship-based operations? The partners will focus on ways to avoid or reduce the negative effects of water and salt, and to prevent the ship’s antennas from interfering with the helicopter’s control systems. In the first phase of the project, NLR will investigate the helicopter’s aerodynamic properties in the vicinity of the ship by performing Computational Fluid Dynamics (CFD) calculations. Together with Delft Dynamics, NLR will also conduct helicopter tests on land. The tests at sea are expected to take place in mid-2019.